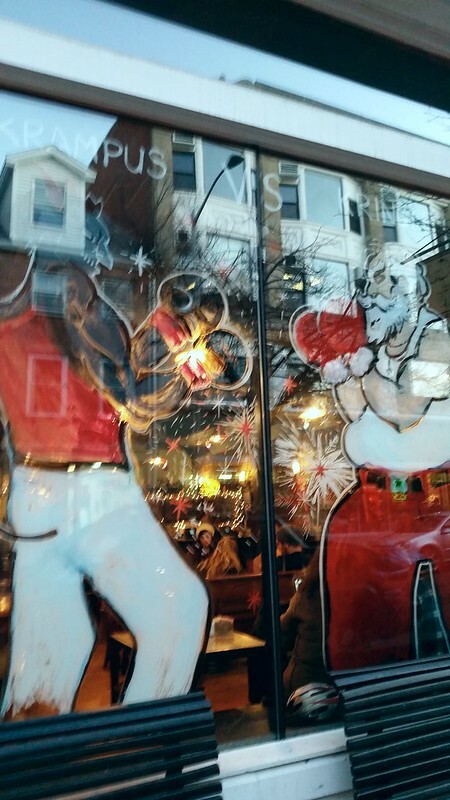 The window at Gulu-Gulu Cafe decorated with a Santa Claus and Krampus getting ready to box. Who doesn't like a good face-off between Santa Claus and...well, whoever! But this is Salem and it wouldn't be right unless Santa Claus was duking it out with some monster (We know he's conquered the Martians, so that question's been answered). But this display was interesting because it clearly grabs attention, but it also a curious depiction. Clearly, the article is playing with opposities, white pants for Krampus, red for Santa and reverse colored shirts. Santa has round facial features while Krampus is all angular. Santa's wavy hair is contrasted with Krampus's poiny hair. But then, we come to the skin color and I wonder about the choice to have Santa as white and Krampus as black. Artistically, it plays with the opposites presented, but I can't help thinking about the ways in which kids internalize the implications of this (among a range of other messages relate to skin color and goodness/evilness).